We’d love your help. Let us know what’s wrong with this preview of Andy McBean and the War of the Worlds by Dale Kutzera. Andy McBean is struggling to survive Middle School in the soggy hills of the Pacific Northwest. He’s messy, fearful of bullies, and hates the rain. And spending much of the last year in the hospital battling leukemia hasn't helped. Then one night a meteor storm devastates the county, cutting off power and communications. One giant boulder skids to a halt right on Andy’s fro Andy McBean is struggling to survive Middle School in the soggy hills of the Pacific Northwest. He’s messy, fearful of bullies, and hates the rain. And spending much of the last year in the hospital battling leukemia hasn't helped. Then one night a meteor storm devastates the county, cutting off power and communications. One giant boulder skids to a halt right on Andy’s front lawn. The glowing meteor draws the attention of neighbors, the media, the army, and even the new girl from Andy’s art class. He is thrilled at the notoriety, but everything changes when the meteor cracks opens and a towering machine steps out. 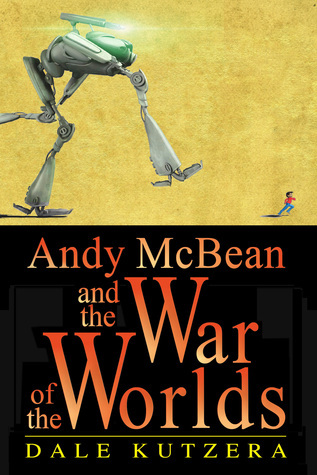 To ask other readers questions about Andy McBean and the War of the Worlds, please sign up. Thanks to those who have read "Andy." Glad you liked it. I'm working on more adventures…and trying to learn exactly how Goodreads works. And how about those great illustrations by Joemel Requeza? While I'm not the target audience, this was still a fun read about alien invasions and saving the world. Based loosely on the HG Wells book, Andy McBean and the War of the Worlds follows a boy, his friends, his father, and an alien and they try to save the world after alien invade earth. It’s pretty cute. It has a nice moral (don’t be embarrassed by your circumstances or what’s happened to you). It’s an excellent book to give to a middle grade age reader to read on their own. It also makes a good family read-aloud. This is an excellent YA book. Or rather, I think it's supposed to be a middle-grade book, as Andy McBean, the protagonist, is in the sixth grade. But it was fun to read, as the author does an excellent job of balancing danger (this is, after all, about a violent alien invasion, and there are deaths and destruction) with whimsy. I downloaded this for free and was pleasantly surprised by how good it is. By now, I've come to have low expectations for most free e-books, but Andy McBean and the War o This is an excellent YA book. Or rather, I think it's supposed to be a middle-grade book, as Andy McBean, the protagonist, is in the sixth grade. But it was fun to read, as the author does an excellent job of balancing danger (this is, after all, about a violent alien invasion, and there are deaths and destruction) with whimsy. I downloaded this for free and was pleasantly surprised by how good it is. By now, I've come to have low expectations for most free e-books, but Andy McBean and the War of the Worlds is much more polished than most freebies I've read. The author's biographical information says Dale Kutzera is a successful screenwriter, and it definitely shows. The plot involves aliens, and has some illustrations. It was a fun read that will definitely engage younger readers. I’m an older reader and I enjoyed it until the end, which felt sad, but was appropriate. There is a great sub-story with a message that is not lost on this reader. I think younger readers will pick up on it too. This is a very “wholesome” book that will delight all younger readers. There is no heavy story here or themes I thought inappropriate. This story not only has an adventure involving aliens, it also has a sub-story that carries a great message about perceived weaknesses. The story includes a female protagonist that is fighting her own issues, and a token goofball best friend. At least in the Kindle edition of this book there are some issues, such as changing tense in the middle of a sentence or missing a word, or a letter, making it the wrong word. Basic things that spell check won't catch but an editor should. So I blame the editor. Or the author if he thought he could edit it himself. I only bring it up because I think that while a future reader should be warned, I don't think it should take away from the enjoyment of the story. I like this new take on the classic At least in the Kindle edition of this book there are some issues, such as changing tense in the middle of a sentence or missing a word, or a letter, making it the wrong word. Basic things that spell check won't catch but an editor should. So I blame the editor. Or the author if he thought he could edit it himself. I only bring it up because I think that while a future reader should be warned, I don't think it should take away from the enjoyment of the story. This was such a fun book, I loved the author’s twist on the War Of The Worlds storyline and how he managed to infuse this children’s book with so many antics. Overall this is a book and series which pokes fun at the classic SFF stories and it will definitely have its audiences among the adult and kid audiences. Andy McBean is a boy who had survived the worst thing ever, cancer. Most of his senses returned to normal with the exception of his hearing. For the most part he is just your average kid with friends, he plays the clarinet and he has to deal with bullies too. But none of that so called normalcy, is anything compared to the aliens that crash landed right in his front yard. Andy was separated from his family and friends. Many of the towns’ people were captured and put into cages in giant robot ali Andy McBean is a boy who had survived the worst thing ever, cancer. Most of his senses returned to normal with the exception of his hearing. For the most part he is just your average kid with friends, he plays the clarinet and he has to deal with bullies too. But none of that so called normalcy, is anything compared to the aliens that crash landed right in his front yard. Andy was separated from his family and friends. Many of the towns’ people were captured and put into cages in giant robot aliens. Many homes and businesses had been trampled and there were no adults to help guide Andy on what to do. His main objective would be to stay hidden and try to reconnect with his family. While hiding, Andy meets a girl named Charlie. Together they survive rain, cold, bullies and even a few aliens. Unfortunately, Charlie gets taken during a chase. Andy decides to stand his ground, he is going against the aliens to save his family and Charlie too. Andy had confiscated an alien weapon, one that will open the cages to free the town. Is it possible that he could become a hero? Is it possible he could have help from a sympathetic alien? From a world that is dying there is Been Tok. He is a worker alien who wanted to study the life living on the blue planet. But only the Masters could be curious. His planet was dry and they needed water to continue to survive. Been Tok knew that mining water from planets with advanced life was against the rules. He wanted to make sure his alien kind weren’t going to cause any harm. He referred to humans as bipeds and discovered that one of them is a warrior. Been Tok had come close to capturing the little warrior but chose to let him go free. There is a growing feeling inside of him that he can’t explain. Perhaps it’s sympathy or defiance against the masters for breaking the rules. Author Dale Kutzera has created a great read geared for boys but girls will love the alien elements too. This fast paced read puts emphasis on all five senses. There is adventure, friendship and a little mystery. Readers will enjoy the main character’s journey towards bravery and finding a hero inside. Teachers would love this as a read-a-loud. Students would be able to discuss and compare what they would do if aliens landed in their yard. This is a great book for a boy who wouldn’t like to pick up a book. Andy McBean just wants to return to a normal life where he isn't viewed by everyone as "the cancer kid." But normal is hard to find when your parents won't let you play soccer and smother you with concern, the bully at school has plans to beat you up, the new girl just might be your new crush, and an alien spaceship crash lands in your front yard. In the chaos that follows Andy is separated from his family, running for his life, and trying to rescue his friends. He'll have to figure out how much Andy McBean just wants to return to a normal life where he isn't viewed by everyone as "the cancer kid." But normal is hard to find when your parents won't let you play soccer and smother you with concern, the bully at school has plans to beat you up, the new girl just might be your new crush, and an alien spaceship crash lands in your front yard. In the chaos that follows Andy is separated from his family, running for his life, and trying to rescue his friends. He'll have to figure out how much he can do on his own and when it's best to ask for help, even from some of those over protective grown ups. With a light tone, Kutzera still weaves in some serious issues, and provides a fun romp through an alien invasion. My favorite parts were those from the perspective of Been'Tok - the worker alien. I really wish there had been more of him! Though the tone of the book from Andy's perspective worked well most of the time, there were a few places where Andy was just a little too self-aware or where the narration tipped into a little too narrator-esque language. These were a bit jarring because most of it was very much Andy. I also felt like the ending section contained a few too many pedantic moments of almost "here is the moral" kind of things. I think even kids reading the book would pick up on the major messages without having Andy articulate them quite so "ah-ha"ly. (yes I'm making up words now). Hi...I admit it...I am a middle grade novel reader. I love them. Their innocence, their dialog, their fun and funny situations, their happy endings. My wife of 32 years says I am mentally stuck at 12 years old. Not sure how I should take that. What about this book? Meh. I liked Andy McBean, but I didn't love it. My biggest complaint was that Andy kept jumping around in age. It wasn't a progression. At one moment he was a kid, and in the next, he was an adult. I just didn't find his character to be Hi...I admit it...I am a middle grade novel reader. I love them. Their innocence, their dialog, their fun and funny situations, their happy endings. My wife of 32 years says I am mentally stuck at 12 years old. Not sure how I should take that. My biggest complaint was that Andy kept jumping around in age. It wasn't a progression. At one moment he was a kid, and in the next, he was an adult. I just didn't find his character to be consistent. But my second complaint was that some of the situations in the story just felt forced. I want the kid to come through to "figure things out" or "save the day" at various times throughout an MG story. Without giving anything away, all I can say is that Andy comes through even when it doesn't make sense. To put it generically, it is like the author places Andy in a situation with smart, competent adults, but somehow, Andy is the only one that can come up with a solution. I'm not sorry I read the book. I enjoyed it enough to finish it. And I feel that kids would get into this, especially young boys--and I think that is important, since many boys won't sit down long enough to read a book. The “boy who had cancer,” Andy McBean, lives in the damp and soggy Pacific Northwest and plays Zoink with “the boy who played clarinet.” Meanwhile Been’Tok is a rather bored underling Worker, mining water from Mars. And the worlds are filled with misfits. Author Dale Kutzera creates a convincing modern day school, peopled with band-players, goths, school nurses, and more, adding dialog with just the right touch, “barf-face” “Dweeb” and “Geek” bandied around between teens. The only problems are bu The “boy who had cancer,” Andy McBean, lives in the damp and soggy Pacific Northwest and plays Zoink with “the boy who played clarinet.” Meanwhile Been’Tok is a rather bored underling Worker, mining water from Mars. And the worlds are filled with misfits. Author Dale Kutzera creates a convincing modern day school, peopled with band-players, goths, school nurses, and more, adding dialog with just the right touch, “barf-face” “Dweeb” and “Geek” bandied around between teens. The only problems are bullies and girls until something mysterious flies overhead. Then Andy McBean gets involved in a War of Worlds. Echoes of the novel’s more famous predecessor ring through the pages of this fast-told tale. Scenes come to life with immediately practical details, such as whether to leave a note after drinking a neighbor’s milk, and the pleasing humor of an alien’s misconceptions of human life keep the tone light and fun. Of course, boy and girl have plenty of misconceptions about each other’s interests too—they might almost be alien as well! Once the action starts, this tale’s a page-turner of death-defying excitement, friendship, honor and trust; a thoroughly enjoyable middle-grade/young adult tale which truly offers something for everyone. Disclosure: I was given a free ecopy and I offer my honest review. The popular title already sets a scene for an adventurous ride - one I hoped could really hold the level it places itself at. Luckily, it did. We are introduced to Andy, the boy who survived cancer and now, has to deal with his rough everyday life at school. Right away, it's easy to sympathize with him and be drawn into his world with the realistic, modern school setting and dialogue. Although the theme of bullying is introduced, the story quickly turns into a fast-paced adventure, which kept me turning from one page to the next. The scenes are vivid, and there's a perfect amount of slight humor thrown in to keep the entire thing from growing too heavy. Not only does Andy have to deal with aliens, but learns the value of friendship, honor and trust. Especially the entire world of girls throws the boy some loops as he develops a friendship to a very strong character. Summed up, I really enjoyed this. Not only is it always refreshing to run into a good science fiction tale for this age group, but the fast-paced adventure is well tempered and mixed for the middle grade audience. This one definitely gets a big thumbs up! By the time Andy McBean reached the 6th grade, he had already survived cancer. In the midst of navigating the pitfalls of middle school and the gauntlet of bullies, Andy’s world comes crashing down around him. Actually it was his house because a meteor roared through the neighborhood and crash landed in his front yard. But it’s not really a meteor. It’s a spaceship and the aliens inside are none too friendly. Except when Andy comes face-to-face with an alien named Been ‘Tok in the flower shop, h By the time Andy McBean reached the 6th grade, he had already survived cancer. In the midst of navigating the pitfalls of middle school and the gauntlet of bullies, Andy’s world comes crashing down around him. Actually it was his house because a meteor roared through the neighborhood and crash landed in his front yard. But it’s not really a meteor. It’s a spaceship and the aliens inside are none too friendly. Except when Andy comes face-to-face with an alien named Been ‘Tok in the flower shop, he realizes not all of them are alike and maybe that’s the key. Andy shifts into survivor gear once again. Only this time it’s not just himself he must save but his family, his friends, and the whole entire planet. Inspired by War of the Worlds by H. G. Wells, Andy McBean and the War of the Worlds actually brings the aliens to Earth. The action is fast. Andy and his friends are easy to like and fun to watch as they travel by foot. The story is believable, though Andy has several lucky escapes from the aliens (great fun!). Been’Tok is a cute, three-eyed monster with a heart and soul. He loves collecting the odd artifacts he finds while vaporizing various planets for the water his planet desperately needs. H Inspired by War of the Worlds by H. G. Wells, Andy McBean and the War of the Worlds actually brings the aliens to Earth. The action is fast. Andy and his friends are easy to like and fun to watch as they travel by foot. The story is believable, though Andy has several lucky escapes from the aliens (great fun!). Been’Tok is a cute, three-eyed monster with a heart and soul. He loves collecting the odd artifacts he finds while vaporizing various planets for the water his planet desperately needs. He disagrees with his commander, believing humans are significant, especially after Andy saves his life. Overall a fun sci-fi adventure for middle-grade readers. Nicely plotted and only a few minor edits needed for missing punctuation or letters/words. Characters were relatable. Aliens just the right mix of menace and "possible friends" for target audience. One quibble: I felt a bit cheated as a reader knowing before the main characters what the aliens wanted. Would have been better, IMO, if we'd had to figure that out along with them. Andy McBean was inspired by the movie, the War of the Worlds but it doesn't really follow the movie story line so much. It was a well written book, felt like watching a movie. The characters were well developed and the plot moved along nicely. As a seventy year old grandfather I wasn't sure would enjoy a story about a middle school student, but I was wrong. This book was fast paced and well written. I heartily recommend it. This was a good story line as well as well written. The characters were well developed and I really enjoyed it.